In the past couple years, it’s become a beloved tradition: every year when ABC announces the contestants on The Bachelor or The Bachelorette, one of them inevitably gets canceled for being problematic on social media. Last year, we had Garrett, who somehow still won Becca’s season, and Lincoln, and on Colton’s season we had Tracy, all of whom made ABC’s alleged vetting process look less legit than Olivia Jade‘s SAT scores. Last week, immediately after the conclusion of Colton’s season, ABC surprised us by releasing all 33 of Hannah B’s men, and no one was impressed. Just from a first glance, I was truly confused what casting technique Mike Fleiss used to arrive at this disappointing crop of guys. There are some definite fixer uppers in this bunch, but also just some trash. 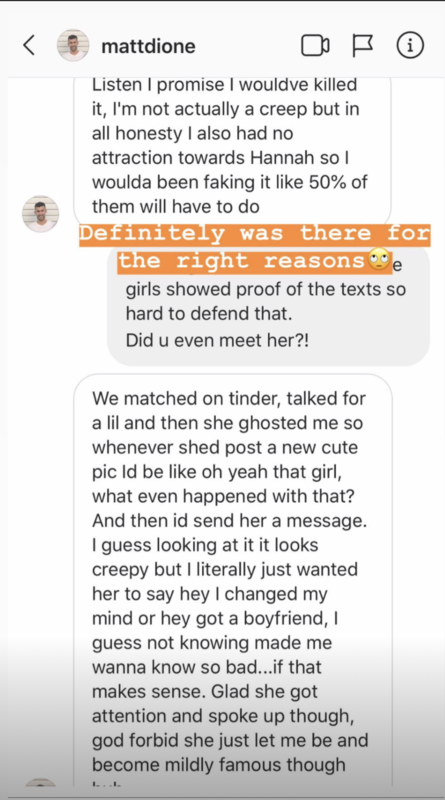 Over the weekend, one of Hannah B’s contestants had his shady Instagram past exposed, and we need to address it. This is Matt Dione, he’s 31 years old, and he’s from Winter Springs, Florida. Of course he’s from Florida. Matt looks like the exact kind of guy who would only text you after 1am, and it turns out that’s not so far from the truth. On Friday, Twitter user Sam Smithburger posted screenshots of her Instagram DM thread with Matt, and it is appallingly one-sided. As you can see, Matt DMed this poor girl for two full years with literally no response, which is pretty pathetic even for the most ambitious of f*ckboys. My personal favorite is when he calls her Sam Smith, because I’m not sure if it’s a typo or a reference to Sam Smith the singer. I’m going with the latter. In any case, it is f*cking ridiculous to continually contact someone for YEARS without receiving any kind of response. I know men are stereotypically dumb and can’t take hints, but COME ON. Sorry, but I fully spit out my water when I got to the end. “God forbid she just let me be and become mildly famous” is definitely one of my favorite sentences I’ve ever read, but also lmao at this dude thinking he’s going to become famous from being on The Bachelorette. Sorry, but he is not top-four material. Matt is also doing a textbook straight man behavior, which is realizing that your behavior was creepy, but still trying to justify it. Men everywhere, please stop this. Everyone makes mistakes, but once you see the creepy aspect, just cease and desist. No one wants to hear your reasoning. Filming for the Hannah B’s season of The Bachelorette started late last week, and multiple Bachelor spoiler accounts are reporting that Matt has already been sent home. It’s unclear whether his elimination was due to these DMs or just because Hannah B. didn’t like him, but it looks like he won’t be making it to hometowns or becoming mildly famous. Shame! Now, she just has 32 other duds she has to get through before she can achieve her true potential as an influencer. Stay strong, Hannah!